Kimchi. It’s having a moment here in America, but in Korea, it’s a beloved dish that has been a part of daily life in the country for thousands of years, having been first mentioned in The Chapter of Dongyi, in the Book of Wei, the Record of the Three Kingdoms, along with its primary flavoring spice, gochugaru. 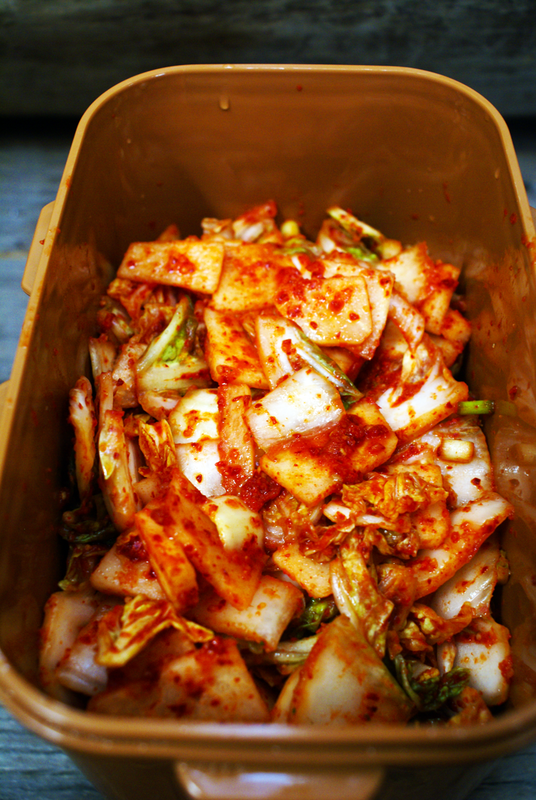 In its most basic sense, kimchi is essentially fermented cabbage, much like German sauerkraut. There are lots of variations in kimchi recipes, probably as many as there are in a good Texas chili. As an INTJ and a foodie, I’ve been fascinated by fermentation because it is a great combination of two of my intellectual interests, science and eating! I’m no expert in the subject, but I’ve dabbled in fermentation, making yogurt, crème fraiche, quick pickles, and yes, kimchi. Food Fermentation is time intensive, but relatively easy to do, which is great for an INTJ looking for a long term project that doesn’t require babysitting. 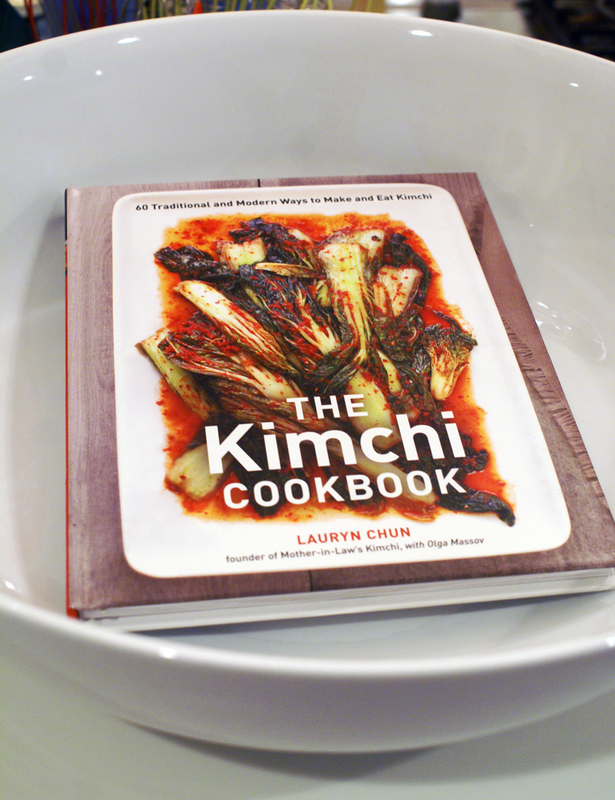 To further my kimchi knowledge, I recently purchased The Kimchi Cookbook by Lauryn Chun. It has 60 recipes covering different types of kimchi and ways to eat it. Chun is the founder of Mother-in-Law’s Kimchi, a gourmet kimchi supplier, so she really knows her stuff. I’ve tried two recipes from the cookbook so far and have really enjoyed the results. The recipes are easy to follow and Chun offers interesting cultural insights on the history of kimchi. Today’s Uttori is Chun’s Square-Cut Napa Cabbage Kimchi recipe. One thing I love about this recipe is that it’s not too salty. 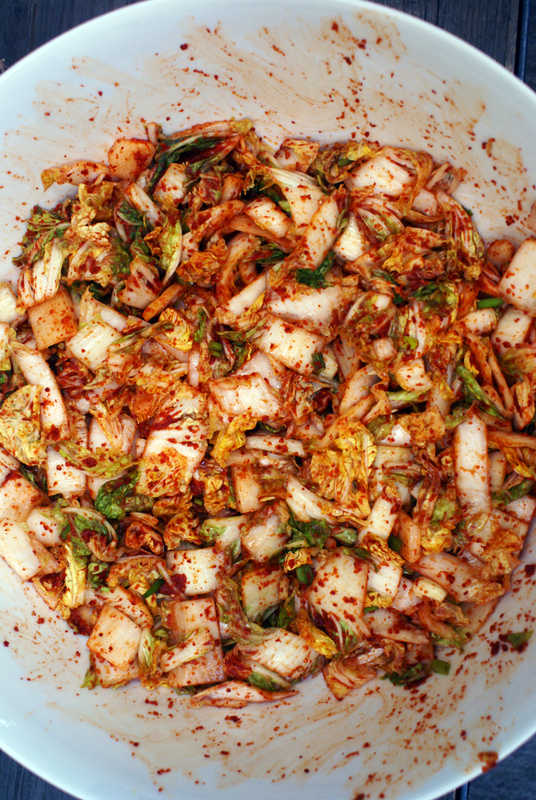 Other kimchi recipes I’ve made recommend letting the cabbage sit overnight in the salt brine. For my personal taste, this results in a kimchi that’s too salty, no matter how much I wash it. Chun suggests only keeping the cabbage in the salt brine for an hour. I think this tip really helped produce a kimchi that was flavorful and seasoned, without being overly salty. Here’s Chun’s recipe. Happy fermenting. 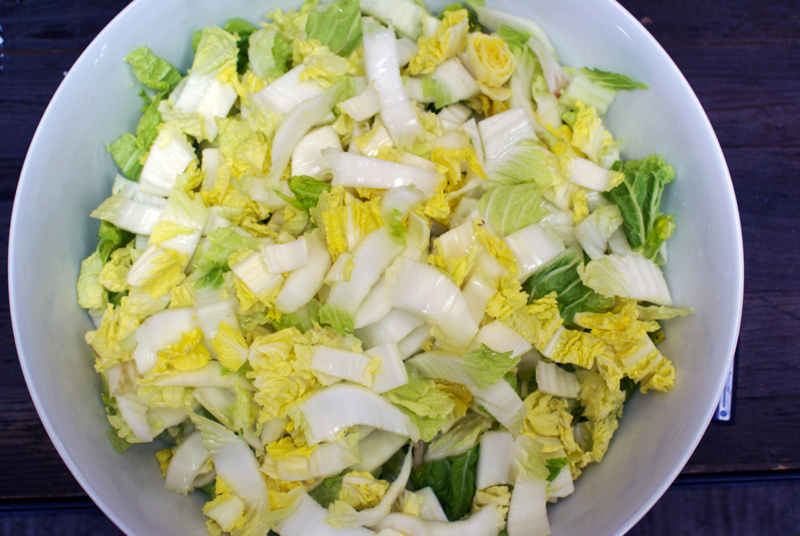 Start with fresh napa cabbage. 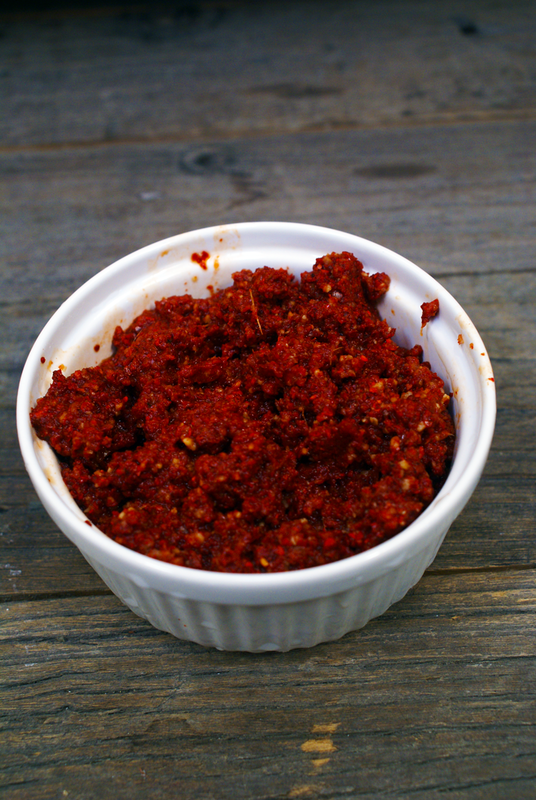 Gochugaru is the primary seasoning spice in Kimchi. It’s less hot than Mexican chilies, so test to find out the level of spiciness for your palate. Starting to look good, but before you’ve got kimchi, it has to ferment. I use a fermentation container that I bought on Amazon. Now it’s ready. See the recipe below to make your own. Enjoy. In a large bowl, combine the cabbage with the salt and set aside for about 1 hour. Drain the liquid and rinse the cabbage to remove any traces of salt. Let the cabbage drain in a colander for 20 minutes, or use a salad spinner to remove most of the water. Meanwhile, make the seasoning paste. In a mini food processor fitted with a metal blade, pulse together the onions, garlic, ginger, anchovy sauce, shrimp, and sugar until a paste forms. Transfer to a bowl and mix in the chile pepper flakes. Set aside for 15 minutes to let the flavors combine. In a large bowl, mix together the green onions, seasoning paste, and drained cabbage until combined thoroughly, making sure the seasoning paste is distributed evenly among the leaves. Pack the mixture tightly into a 2 quart container (I happened to have a kimchi container that I used). Add ¼ c water to the mixing bowl, and swirl the water around to collect the remaining seasoning paste. Add the water to the container, cover tightly, and set aside for 3 days at room temperature. The cabbage will expand as it ferments, so be sure to place the jar on a plate or in a bowl to catch the overflow. Refrigerate and consume within 6 months. 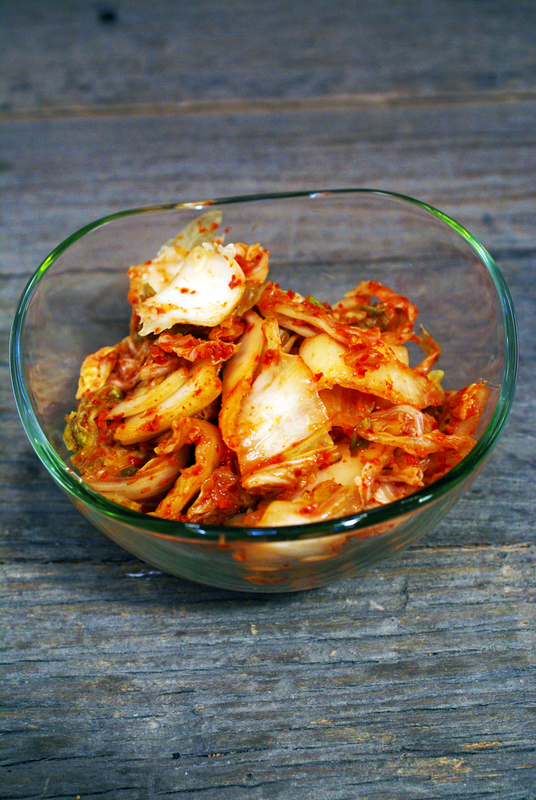 Try making this kimchi for yourself. And definitely check out the Kimchi cookbook!